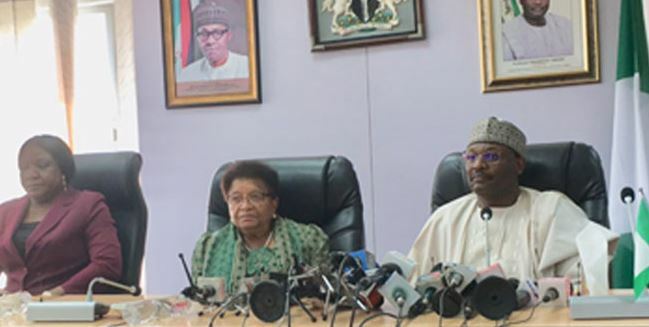 The Head of ECOWAS Observer Mission to Nigeria and former Liberian President, Ellen Johnson Sirleaf, today, met with the Chairman, Independent National Electoral Commission, INEC, Yakubu Mahmood at the INEC headquarters in Abuja, where she promised to help ensure a peaceful, free and fair elections in Nigeria. Sirleaf who arrived Nigeria on Tuesday, also said that her visit was to get more pieces of information as regards Nigeria’s coming election. She was earlier received by the Vice- President of ECOWAS Commission, Mrs Finda Koroma, at the Presidential Wing of Nnamdi Azikiwe International Airport, Abuja, on Tuesday. “I hope to meet with political leaders, I want to be able to understand the role I have to play to make sure that I am well prepared to carry out the function. “I am pleased that it is an ECOWAS assignment and I will be working with them (ECOWAS Commission) and they will guide me and I just expect that I will join all Nigerians to make sure that this whole process is so peaceful and successful. “That is the purpose of my mission,” she said. The former Liberian president also said she would share in the findings of earlier missions and consult with those who had been on ground. “I cannot make a statement till I have had an opportunity to be able to share in the findings of earlier missions, to consult with those who have been on ground. “At a later date, the ECOWAS Observer Mission will be fully engaged, will carry out its functions and speak when it is time to speak,” she said.